← How to keep toys on their cards while still playing with them. July 5, 2007 was a good day for toys, including Series 4 of the DC Minimates. Though we'd gotten Cassie more than two years prior, this was the series where we got the "real" Batgirl, Barbara Gordon. Sure, she's not Batgirl now, and never will be again, but it's still her boots all the replacements are trying to fill. She's seen here wearing her gray costume with the bright blue cape and cowl. She uses the same pointy gloves as the other Batfolk, but has a new utility belt - you can tell because no one else has the utility purse. "Utility purse." Now that's good gender equality! 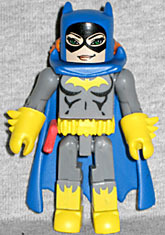 Batgirl doesn't get a batarang, for whatever reason, but her mask is removable. Like most of the DC Minimate masks, it's a tube with the face painted on. She's got a cute little half-smile that really suits the character. So she's not permanently bald, she does include a hair piece with the hair pulled back into a thick ponytail thingy that's the same style as the hair poking out the back of her mask. Despite the fact they weren't active at the same time, Batgirl is paired with Bane in this set. Bane was born and raised in a prison, which goes a long way toward explaining his generally crummy attitude. 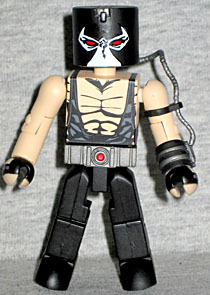 Since the DC license allowed Art Asylum to use the 2½" bodies for Minimates, that's what Bane uses. It also bring us to my main complaint with the DC Minimates; namely, they shouldn't have used the 2½" bodies. Yes, Bane is bigger than Batgirl, but a company that doesn't consider its competition is foolish. I can't say for sure that the reason the DC Minimates failed to take off is because the big figures looked stupid standing on the shelf next to 14 series (at the time) of Marvel Minimates, but I can't rule it out either. Bane is a big guy, but he's still a baseline human being. According to the Minimates, though, he's 25% taller than the Incredible Hulk. That ain't right. The figure has nicely detailed paint for the chest, and his hands are painted to look like gloves. The controller on his wrist is a new piece, as is the band on his upper arm that the tube runs through. The tube plugs into the back of his mask to deliver doses of the Venom drug that give him his power. The face of the mask is painted, but the gear on the back of the head is sculpted, as is the zipper running over the top. You can remove the mask to reveal his normal face beneath: it looks just like it did in the comics, with a brown buzzcut and a general sense of anger. Batgirl's nice, and so's Bane, but I can't look at him without thinking about how awesome it would have been to get the rest of the Secret Six team in Minimate form. We really missed out on a lot of cool stuff when the DC Minimates ended prematurely.